Take a look at the photos below of Wasp spider. 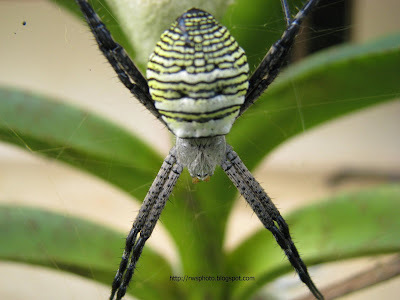 The yellow, black and white spider is also known as Argiope bruennichi. The Wasp spider is also similar to Saint Andrews Cross spider (sp. Argiope keyserlingii). I know spider has unique set of eyes but I just couldn't get closer to really have zero macro shoot of the eyes. Spider bites, so I avoid the risk. 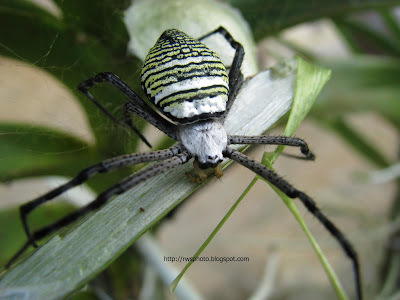 Argiope bruennichi, or the wasp spider, is a species of orb-web spider distributed throughout central Europe, Northern Europe, north Africa and parts of Asia. Like many other members of the genus Argiope, (including St Andrew's Cross spiders), it shows striking yellow and black markings on its abdomen. The spider builds a spiral orb web at dawn or dusk, commonly in long grass a little above ground level, taking it approximately an hour. The prominent zigzag shape called the stabilimentum, or web decoration, featured at the centre of the orb is of uncertain function, though it may be to attract insects. When a prey item is first caught in the web, Argiope bruennichi will quickly immobilise its prey by wrapping it in silk. The prey is then bitten and then injected with a paralysing venom and a protein dissolving enzyme. The male of the species is much smaller than the female. It can often be seen in or near a female's web waiting for her to complete her final moult, at which time she reaches sexual maturity. At this time and her chelicerae (jaws) will be soft for a short time and the male may mate with the female without the danger of being eaten. During Summer 2006, research was carried out in the UK to find that there has been an influx of these spiders to the UK. The colour is still similar, although the yellow stripes are a bit more cream coloured. Great blog and beautiful photos. Thank you for sharing. Keep up the good work!!! This is great. It has helped me so much with my project on the Wasp Spider. Thank You.!! Can you tell me where you were in Borneo when you took this photo? 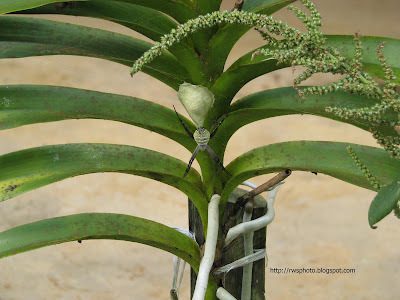 The photo of the spider is taken in Kuching, Malaysia.